Morris Claiborne may have been gifted a pick six, but it should be noted it was his pass break up that created another pick for the Jet’s defense. He had himself a largely stellar day in coverage. It hasn’t been a season to remember for Leonard Williams, and this continued against Indianapolis. It’s fair to say at this point that he’s getting outplayed by Henry Anderson, who may struggle to anchor down against double teams but has a knack for being more disruptive when engaged in one-on-one blocks. Looking like anything but a rookie, Sam Darnold wowed all game long. He looked fearless in the pocket and shrewd with his decision-making in what is surely the best performance of his young career to date. If this is a sign of things to come, you’ll forgive Jets fans for being extremely excited. It might be worth going back and watching Bilal Powell when he first entered the league because while most runners seem to lose a little the longer they’re in the league, he looks as, if not more, powerful and elusive with each year in the league he accrues. He regularly took far more than his line was giving. The day couldn’t have started much worse for Andrew Luck, as a Marlon Mack drop became a pick-six before he almost threw another one on the same drive. 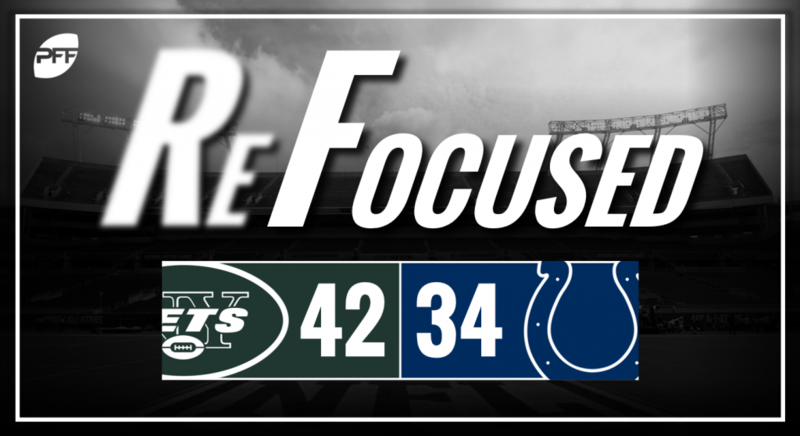 That was indicative of an up-and-down day where Luck threatened to lead a comeback but ultimately threw the crucial pick when he didn’t see Darron Lee lurking underneath late in the fourth. There was some good and some bad from a Colts offensive line filled with former first-round picks. There were some nice blocks from Ryan Kelly, especially when he was pulled into space, while Quenton Nelson had perhaps the block of the game in the second quarter near the goal line. As for Anthony Castonzo, he didn’t have his best game in pass protection, holding up for the majority of the game but having a shaky fourth quarter. He only got 11 snaps, but Jihad Ward laid down a case for more playing time with some impressive reps. His best was an immediate win with a spin move that showed he could offer this defense something it’s missing. When you can come off the street and play as well as Mike Mitchell did, you have to wonder why it took so long for a team to call him. The former Raider and Steeler was particularly active around the line of scrimmage in an impressive Colts debut. Feisty work in the secondary and good decisions being made on offense helped Darnold & Co. pull off the win. Too many mistakes on offense put them in a spot where they lacked the consistency to overcome.